Per Federal and State Law Carmichael Water District has implemented a program to set rules and procedures to eliminate, monitor, protect, and prevent cross-connections in the public water supply. A cross- connection is an unprotected actual or potential connection between a potable water system used to supply water for drinking purposes and any source or system containing unapproved water or substance that is not or cannot be approved as safe, wholesome, and potable. Backflow is the undesirable reversal of flow of potentially contaminated water into the potable water supply. 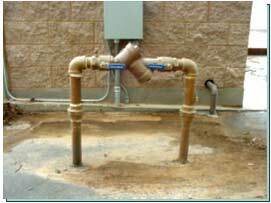 The two types of backflow are backpressure and backsiphonage. Backflow can be prevented by the installation of an Air Gap or an approved backflow prevention assembly installed on the service line. Through surveys and inspections Carmichael Water District will determine which properties are required to install backflow prevention assemblies. If an installation is required you will receive a letter outlining the steps you need to take to be in compliance. The installation, maintenance, and repair of the backflow prevention assembly is the responsibility of the customer. The assembly may be installed by a property owner, plumbing contractor, or general contractor subject to Title 17 of the public health code and Carmichael Water Districts Construction Standards and Specifications. Contact the County Of Sacramento for any permit requirements. Generally, the backflow prevention assembly must be located as close as possible to the service connection. Contact Carmichael Water District for consideration of any variance on the location. Do backflow prevention assemblies need to be tested? Yes, backflow prevention assemblies are equipped with internal seals, springs and moving parts that can wear or break. Assemblies must be tested annually to ensure proper operation. Who can test my backflow prevention assembly? Testing shall be performed by a certified tester employed by Carmichael Water District. What will it cost to have my backflow prevention assembly tested? Carmichael Water District charges $60 per test which will show up as an adjustment to your monthly bill. In the event the assembly fails the initial test one re-test shall be performed at no additional charge. Are backflow prevention assemblies subject to freezing? Yes, often backflow assemblies are damaged beyond repair by the winter freeze. 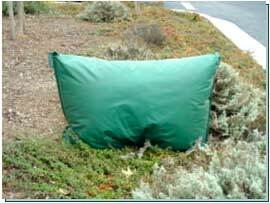 Carmichael Water District strongly recommends you to consider freeze protection for your backflow assembly. E-mail any questions or comments about our Cross-Connection Control program to mark@carmichaelwd.org.